Embark on a small group journey and discover the world in a more intimate way with more personal experiences that bring you deep into the culture. From vibrant cities to remote villages, you'll become part of these worlds. Today's cultural explorers like you will enjoy the more active, authentic experiences taking you on the road less known to meet the people that call it home. You'll indulge in spectacular regional cuisine immersing you in the avour of the region. Learn how to farm in Peru, hunt and taste truf es in Italy, cook Vietnamese cuisine – moments of connecting with the culture while dazzling your senses. Delight in your boutique accommodation that captures the spirit of each destination. All the while, meet friends you never knew you had and become a local as you explore on your own. This is what sets Collette apart. Travelling with Collette comes with benefits that take the guided travel experience to another level. Collette's inclusive tours offer you more value for your money while also ensuring that each element adheres to Collette's exacting standards. With a focus on service and quality, Collette gives you more of what makes travel special. Your Collette Tour Manager is with you throughout your travel experience. This is the only way to travel. From finding the perfect hotel to blending cultural experiences and free time with incredible must-see inclusions, Collette does it for you, seamlessly handling it all — you simply revel in the adventure. No matter how you want to see the world, Collette can take you there. Whether you want to travel across an entire country, dive into a local culture or come to know one of the world's great cities, Collette has the travel experience that's right for you. See the world the way you want to see it. With over 90 tours across the world, the possibilities are endless. 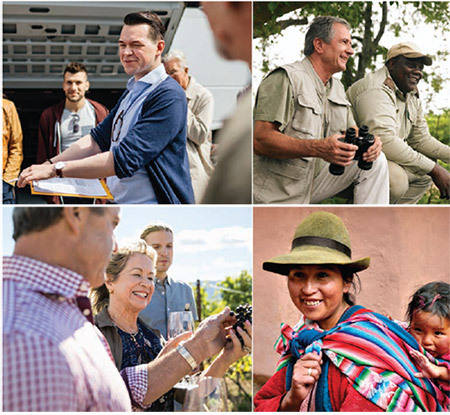 With just 12 to 24 passengers, these personal adventures focus on culinary experiences, cultural immersions and unique accommodations that capture the destination. Enjoy a new perspective on the world. Enjoy the finest in horticulturally themed travel with esteemed partner, the Royal Horticultural Society. Combine the thrill of guided travel with experiences at the world's great gardens. Collette is a third generation, family-owned company with offices in the United States, Canada, Australia and the United Kingdom. Since 1918, Collette has been sharing a love of travel. Today the worldwide travel collection features comprehensive land tours, river cruises, rail journeys, small group tours, garden holidays and more. Begin and end your tour in style and comfort. Private chauffeur drive service is included on all Collette tours for customers within 40km of an Australian international airport. A uniformed driver in an executive car will collect you from your home and take you to the international departure terminal. And on your arrival back to Australia, your driver will be waiting for you at the arrivals terminal to take you home. A truly luxurious way to begin and end your Collette experience! People who ordered Explorations - Small Group Touring Worldwide also ordered the free travel brochures below. Click on the images to find out more about these brochures.